‘Magic, n. An art of converting superstition into coin. There are other arts serving the same high purpose, but the discreet lexicographer does not name them.’ (Ambrose Bierce, The Devil’s Dictionary). Ambrose Bierce’s satirical quip on magic did not make it through editorial selection for this anthology of perspectives on how to define the problematic term. Nevertheless, Bierce targets a revealing detail in a deliciously subversive way: Definitions of “magic” are often woefully underdetermined by historical and ethnographic data, and the use of the category thus typically relies on the (often ideological or theological) discretion and sensibility of the lexicographer rather than on whether or not the features the term picks out belong exclusively to certain clearly defined phenomena. Distinctions between “magic” and “religion” tend to conceal the fact that the practices and beliefs thus labelled overlap significantly on the ground. Why is praying for the defeat of a military foe part of “religion”, while casting spells on the same enemy “magic”? Can we uphold distinctions like these without recourse to theology? This and many other problems in the study of magic are outlined and documented in Defining Magic: A Reader. 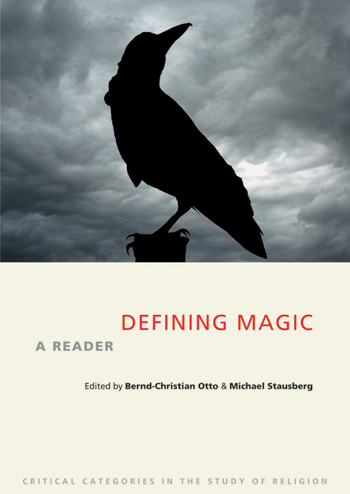 Bernd-Christian Otto and Michael Stausberg have created a reader of generally influential texts on magic, spanning from antiquity to the present, with a focus on classics in the academic struggles to define the concept for the sake of historical and ethnographic analysis (check out the table on contents here). In addition to reprinting twenty previously published texts, the editors have also commissioned five new articles from contemporary scholars generally known for their theoretical contributions to the study of magic. The result is a very valuable, although not flawless, collection that serves as a useful roadmap to novices in the study of magic. To more established scholars it may serve as a crucial reminder of the confusing state this concept has gotten us into. But more than that, it also suggests some interesting new pathways to escape that precarious situation. The composition of Defining Magic is notable for the somewhat unconventional choice of starting with ten texts labelled “historical sources”, spanning from Plato and Plotinus to Diderot and Blavatsky, before continuing to theoretical texts from the nineteenth to twenty-first centuries. There is a good point to doing this, which becomes clear by reading the useful editorial material in the book and paying attention especially to the most recent theoretical contributions. Several patterns of meanings connected to “magic” and its cognates start taking shape in the earlier, mostly Greek, source texts. These patterns trickle through the middle ages and eventually feed into derisive pronouncements on magic in the Enlightenment, before getting picked up again in occultist understandings in the nineteenth century. Eventually, the various permutations of these words and meanings create a broad semantic field which later scholarly attempts to define “magic” draw upon. Reconstructing some of this development through a broader combination of texts is thus a major asset of this work. It encourages a parallel diachronic reading of texts that automatically historicises the concept. That is not to say that the particular selection of texts is beyond reproach. For the earlier period, critical eyes will not fail to notice a bias towards Greek and Latin sources, to the neglect of Egyptian, Hebrew, and Arabic material. Moreover, there is a predominance of texts where “magic” and cognates are used derogatorily, with the omission of “pro-magic” authors and theurgists such as Iamblichus, Proclus, the hermetic texts, or the Chaldean Oracles. This focus on “magic” as a negative label applied to others is entirely in tune with some currently dominant theoretical positions, but it might obscure a more complicated history of use. One notable exception is that the editors include two very interesting definitions from the Suda (ca. 970 CE) – the most comprehensive and influential surviving encyclopaedic work from the Byzantine Empire. In sharp contrast to developments in the Latin west, the Suda distinguishes clearly between mageia, goeteia and pharmakeia, and attributes different values to them. While goeteia (“sorcery”) and pharmakeia (“witchcraft”) were considered bad and depraved practices, mageia (“magic”) was wholly positive: ‘It is the invocation of beneficent spirits for the production of something good; like the oracles of Apollonius of Tyana’ (47). This understanding appears more in line with the neoplatonic theurgists. It would in fact resurface in the west, too, during the renaissance rehabilitation of magic, especially in Agrippa von Nettysheim – although in a different text of Agrippa’s than the one reproduced in this volume. The apparent continuity of this line of thinking about magic in the Byzantine world raises the question of a strikingly different and completely underexplored trajectory in the conceptual history of magic. As the editors ask: ‘was the term mageia generally used in a positive sense in medieval Constantinople?’ (46). This appears to require further research. The neglect of the renaissance revival of magic is another notable omission in the source material, as is the complete absence of medieval pro-magic texts culled from the grimoire tradition. Between Aquinas and Agrippa (both included) there is much else that must be explored for a sufficient picture of medieval and renaissance conceptions of magic to emerge – from Liber Iuratus to Ficino, Pico, Lazzarelli, or Dee (for some of the complexity of magic in this period, see Hanegraaff 2000; cf. Klaassen 2013) Finally, to use one minor text by Blavatsky as the sole representative of post-1800 source texts on magic seems thin. After all, people have never written more about magic as a positive form of practice than during this period, stretching roughly from the mid nineteenth century until today, nor has the practitioner’s literature on magic been more diverse (cf. Asprem 2012). The poor selection of modern and contemporary magical texts reinforces an unfortunate impression that magic belongs to the past, whereas in fact “it” has never been more vital than under modernity. Moving on to the part of the volume that seems more central to the aim of the book (i.e. to provide readings of attempts to define the concept for academic purposes), critics may notice other curious omissions. Seminal texts by E. B. Tylor, J. G. Frazer, Mauss and Hubert, and Emile Durkheim fill the section on “Foundational Works of the Academic Debate”. The list of notable absentees, however, includes Freud and Weber, who have inspired entire schools of later theorizing (for better or for worse). Part three on “Mid-Twentieth Century Approaches” includes seminal texts by van der Leeuw, Evans-Pritchard, Malinowski, Horton, Tambiah and Leach, but it also omits influential contributions by people such as Lévy-Bruhl, de Martino, Lévi-Strauss, Mary Douglas, or Rodney Stark. Indeed, it seems possible to create an entirely parallel anthology with a completely different set of authors and texts. While some of these omissions are indeed problematic, I do not think they undermine the project too much. The editors Otto and Stausberg are in fact very clear on what is missing, and provide very helpful and rich discussions of the broader literature in their editorial introductions to the four main parts, and to each individual text. This sort of material is extremely helpful, and effectively embeds the selected texts in a broader context. Readers who wish to extend their view can easily use this as a guide and pursue the references on their own. One other aspect of the selection process deserves to be mentioned. In the case of this book, it is clear that the editors are in fact not to blame for the omissions. Instead, copyright structures and commercial aspects of the academic publishing industry have put unwanted and artificial restrictions on their work. The editors discreetly vent their frustration in the introduction: ‘in several cases there was an unfortunate mismatch between the royalties requested by some publishers and the budget at our disposal, so that we were unable to reprint some texts we would otherwise have wished to include’ (13). It is unfortunate that some publishers have discovered the use of royalties as an extra revenue stream when selling academic work back to the academy that produced it. For students and the academic community, the result in this case is that a well-conceived resource planned by two leading specialists is prevented from reaching its full potential. The dissemination structures that are supposed to further the academic community instead become an impediment and an obstacle to the effective development and communication of knowledge. In the face of such purely commercial obstacles, however, the editors have done a formidable job in making use of the material available to them and presenting it in a form that takes maximal advantage of each text. Interesting review; I look forward to the second part!